King Mongkut’s University of Technology Thonburi. The Conference is a great opportunity for people working in disability field to present their work and share experiences as well as networking with scholars, specialists and people with disabilities from different countries in the region and throughout the world. 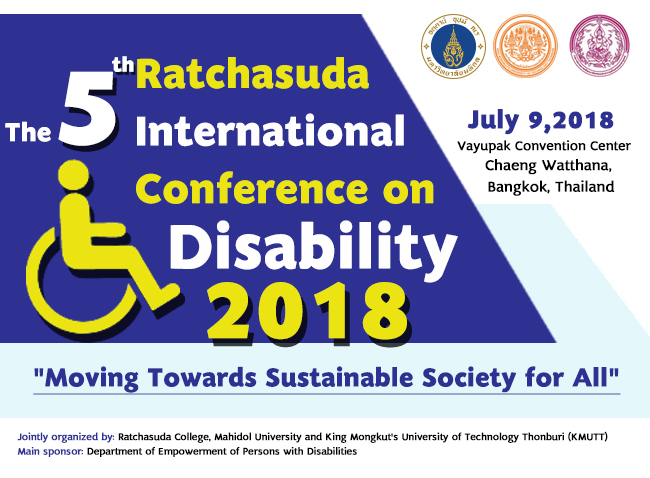 The Conference will include Keynote speakers, oral presentations, group discussion, and disability related exhibition which will reflect on many aspects of disability studies, disability services and innovation through learning and sharing. Presenters are welcomed to submit either abstract only or full paper. Disability organizations or product vendors may come and present at our exhibition booth. All participants are welcomed to join one day tour visiting local disability organizations on Tuesday July 10th. The Conference would be a platform for all participants to discuss current and future trends as we strive towards accessible and sustainable society for all.